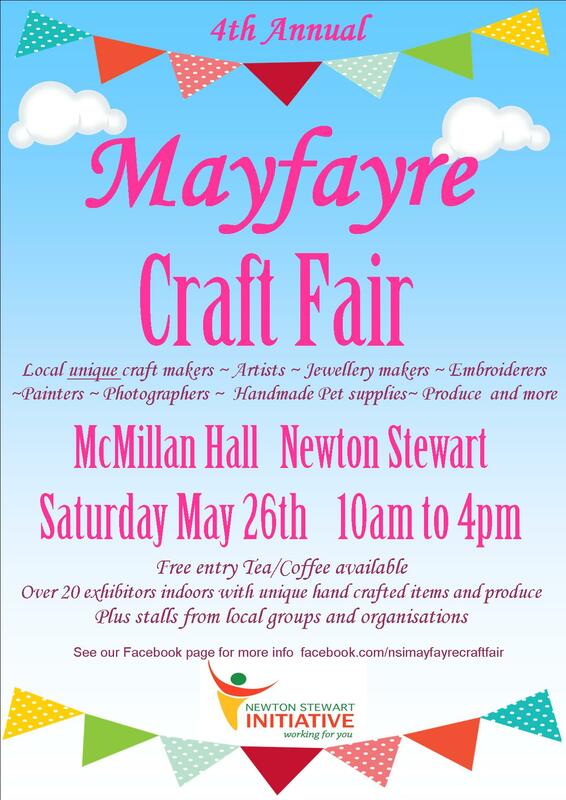 We have already reached the time of year when NSI are pleased to bring you what will be our 4th annual Mayfayre and Craft Fair on Saturday 26th May in the McMillan Hall in Newton Stewart running from 10am to 4pm. Entry is free and there teas and coffees will be available.Hopefully this will see spring time and even summer time launched in all of it’s full glory. 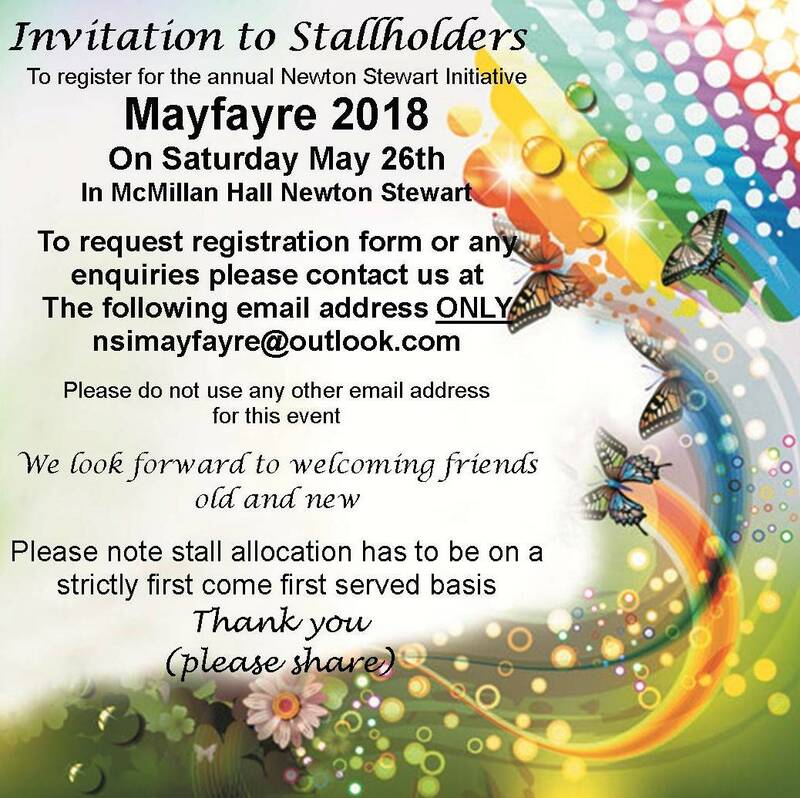 This years Mayfayre is shaping up to be better than ever with a tremendous variety of stallholders covering a huge variety of unique skills producing unique items and gifts that you will often simply not have the opportunity to buy in the shops. Several community groups will also have stalls at the event. PLEASE SHARE OUR POSTER WHERE APPROPRIATE AND POSSIBLE. To save a copy of the poster simply right click the poster and click save image as to your own computer or device and either print or use on your social media or website. Thank you. 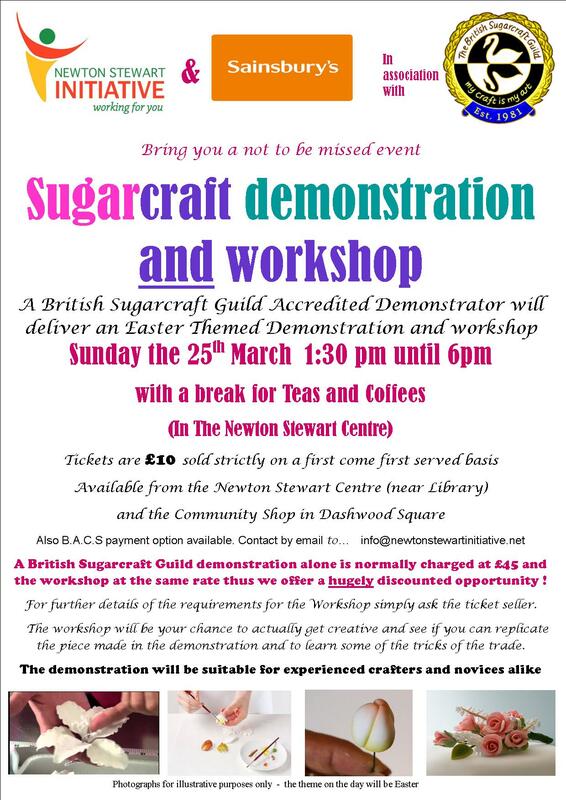 Sugarcraft demonstration and worskshop March 25th book now ! 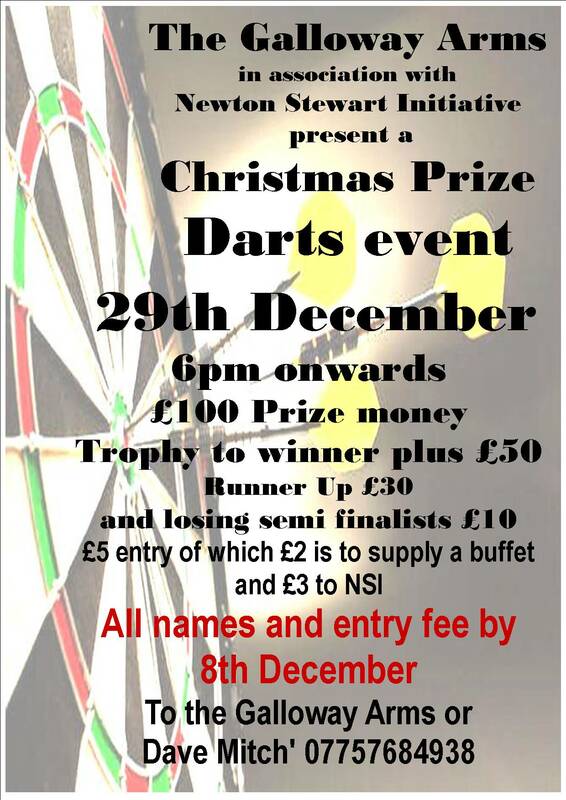 The Galloway Arms in association with Newton Stewart Initiative present a Christmas darts event. This will take place in The Galloway Arms on December 29th. 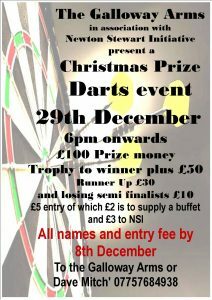 The event will run from 6pm onwards with £100 in prize money to be won. With a trophy to the winner plus £50, £30 for the runner up and £10 for the losing semi finalists. The entry fee is £5 of which £2 will cover the supplied buffet and £3 will go to NSI. All names of entrants with entry fee to The Galloway Arms or to Dave Mitch’ who be contacted on 07757684938. You are most welcome to share our poster. 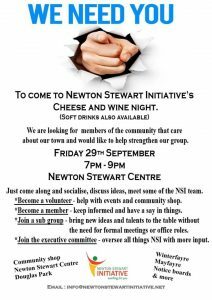 The AGM of Newton Stewart Initiative will be held at 7pm on Monday November 13th in The Creebridge House Hotel, Minnigaff, Newton Stewart. All interested parties and members are most welcome and NSI is hoping for a good attendance. 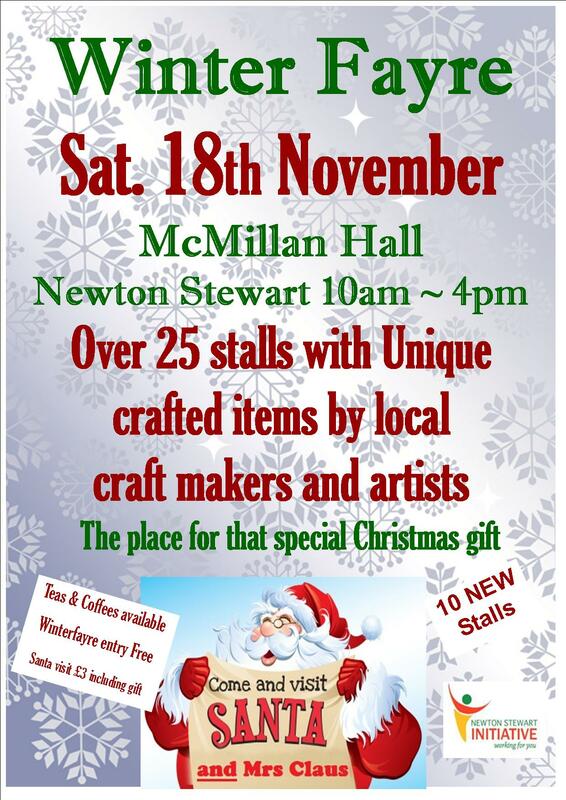 The 2017 Newton Stewart Initiative Winter Fayre will be held once again in the McMillan Hall in Newton Stewart on Saturday November 18th from 10am to 4pm. There will be a tremendous variety of stalls filled with hand made items from talented craft makers and artists from our local region. This truly is a perfect chance to find that special Christmas present that you know is both hand made and locally made by experienced quality crafters who take the greatest of pride in their work and produce. This is that one day chance to buy a unique gift that you will not find in any big shopping mall. Tea and coffees will be available and for the children and Santa will be there in his grotto with Mrs Claus in her busy Christmas kitchen too this year. It is always a good feeling to know that any profit made from the event on the day will go right back into local projects. NSI are organising a fun “Quiz and Curry” night which will be held on Friday 27th October 2017. 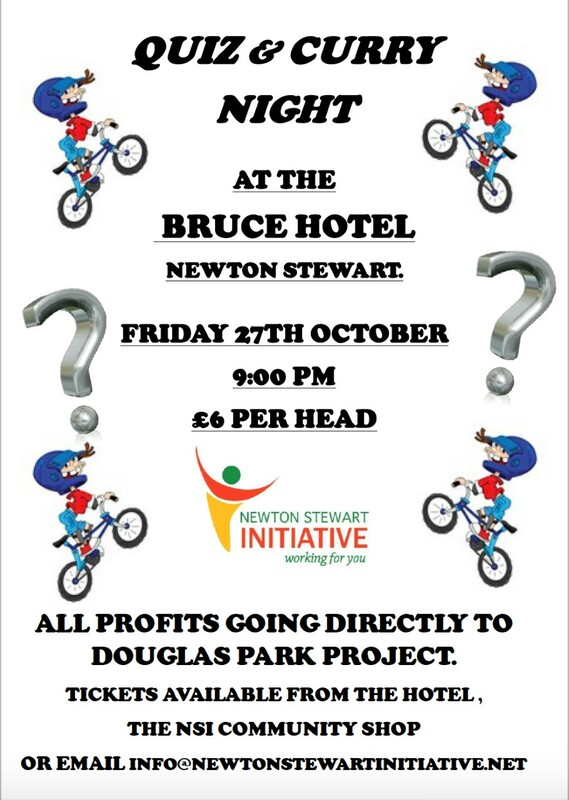 The venue is the Bruce Hotel, Newton Stewart and the quiz starts at 9pm. All funds raised will go directly to the Douglas Park project, details of which can be found elsewhere on this website. Entry is £6 per person with no limit on team numbers. 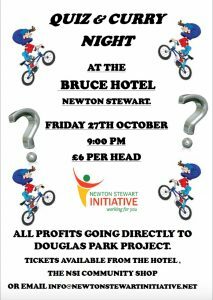 Tickets are available from the NSI Newton Stewart Community Shop or from the Bruce Hotel. We are looking for members of the community that care about our town and would like to help strengthen our group. 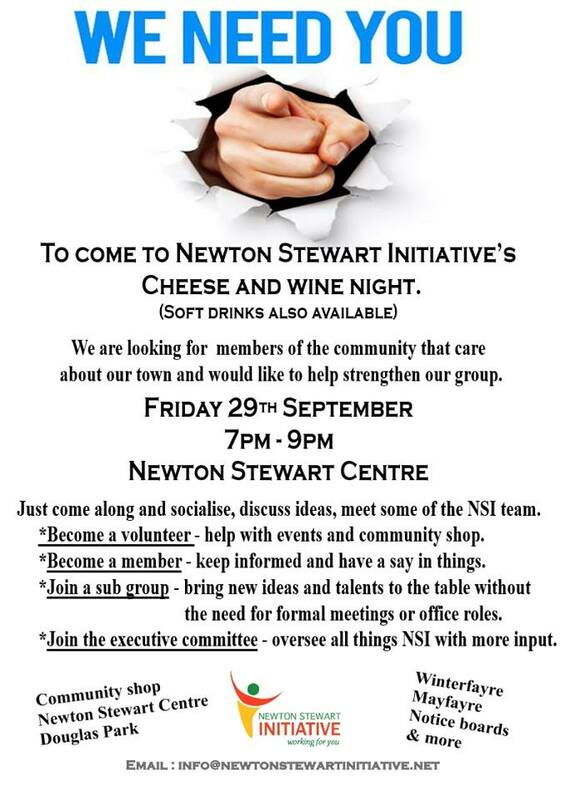 Come along & socialise, discuss ideas & meet some of the NSI team. Sub Groups – Bring New Ideas & Talents to the table without the need for formal meetings or office roles. Join the Executive Committee – Oversee all things NSI with more input. 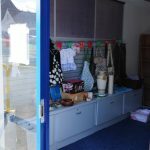 Newton Stewart Initiative has been working away quietly in the background for many months with Dumfries and Galloway Council to secure a long term “community shop” for the town. We are delighted to confirm that having navigated and solved numerous obstacles to getting the shop started, our doors are now open and everyone is very welcome. 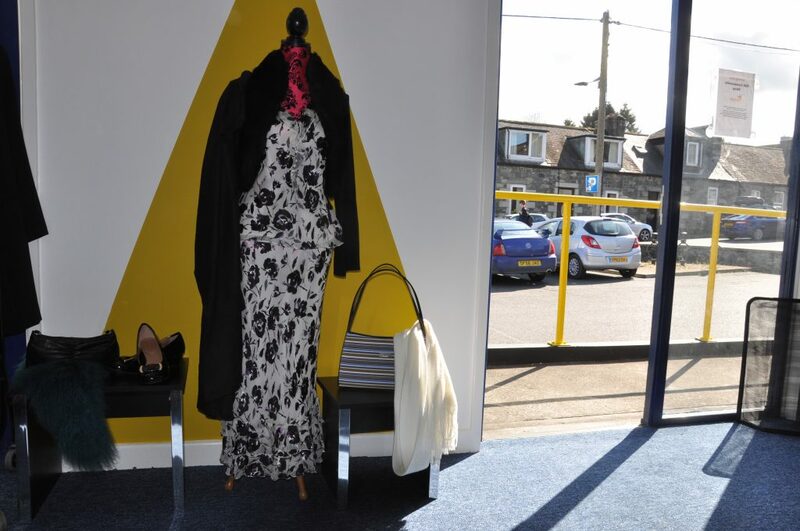 The shop is situated within the building that was the former Tourist Information Office at Dashwood Square car park. 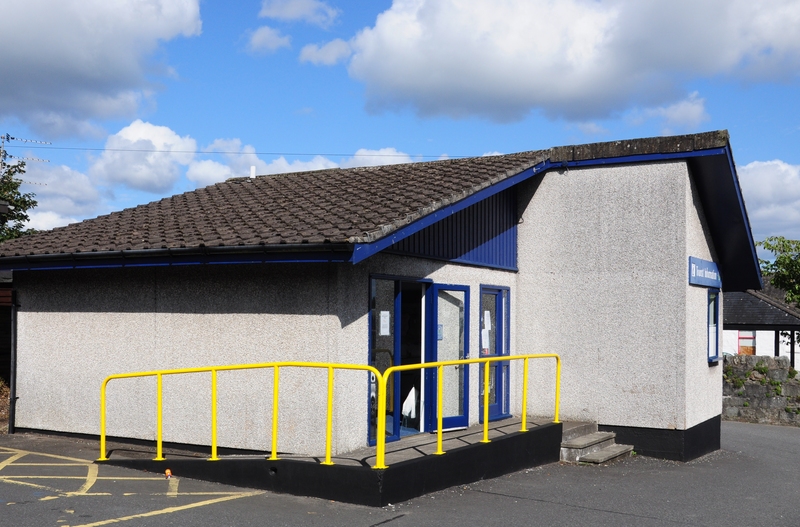 The official opening ceremony of the shop will take place on Saturday September 9th with local MSP Finlay Carson doing the honours as part of the “Day of the Region event.” The shop will be open Monday to Saturday from 10am to 4pm. 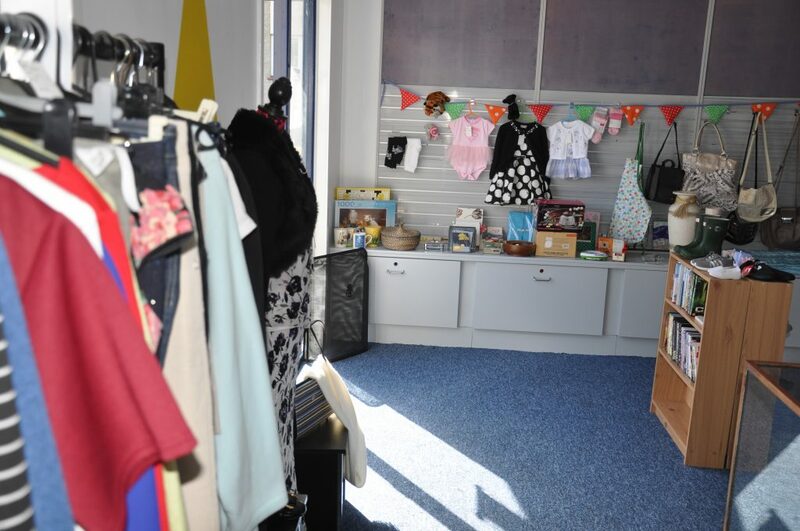 Your community shop will be selling unwanted donated new and pre-loved good quality clothes and items from a wide range. The proceeds will go back into the Newton Stewart and Minnigaff community, in the form of funding local projects and events. 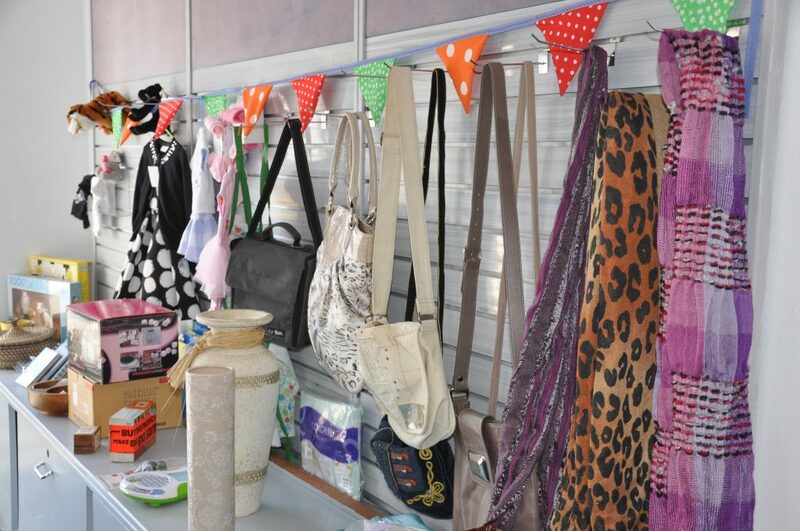 Every item donated and every item bought will help the local community directly. We aim to keep everyone fully up to date with amounts raised, what we have helped to fund, where, when and how. 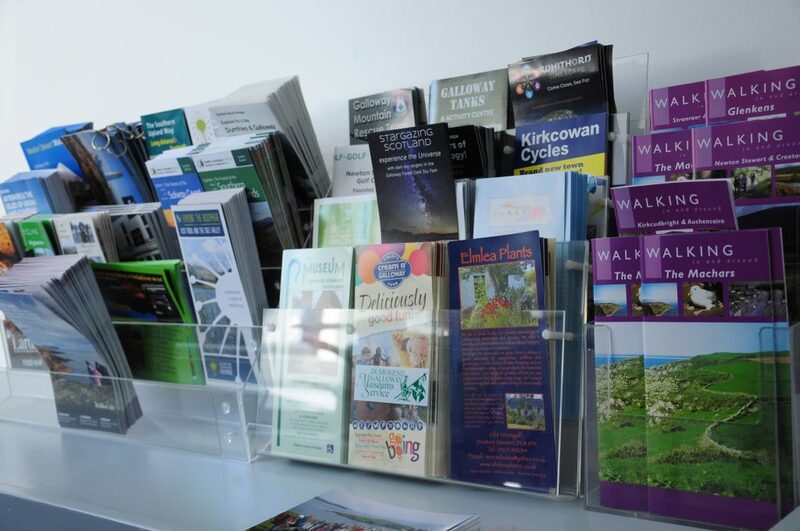 As the shop is situated within the former Tourist Information Office, which closed several years ago, as a courtesy service to visitors we will also do our very best to offer local information and generally try to tell visitors why they should stay and spend time in Newton Stewart and Minnigaff. 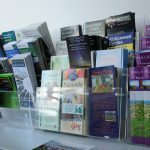 A selection of maps and flyers will be available to visitors. 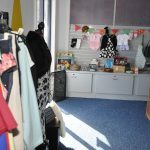 A long term plan in the community shop is also to present an area (space permitting) for local crafters and artists to display their work to visitors with a percentage of any sales also going to fund local community projects and events. 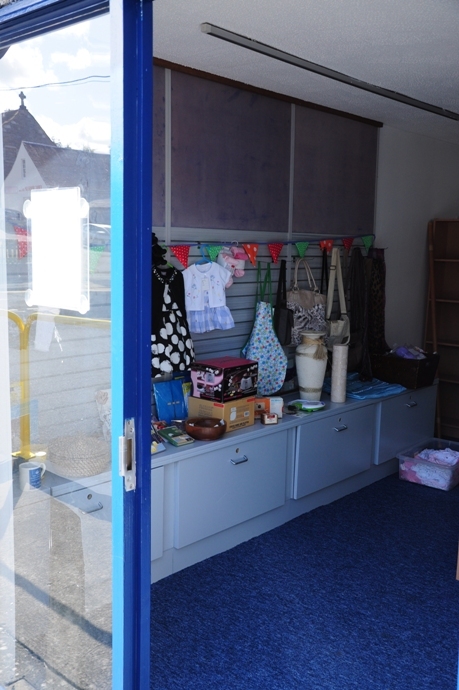 It is good to see what was a long term empty closed building now re-opened as a community shop with the aim of helping our town and community to the best of our ability, in both funds raised and as a point of contact. Please come along and support this new NSI project. 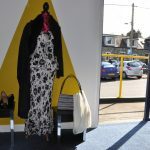 The shop also has it’s own Facebook page which is well worth checking for updates and promotions. 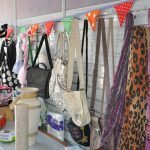 Facebook:- Just follow the link and “like” page to follow for all the updates and Community Shop News. Calling all photographers, budding photographers and owners of phones with cameras. The Newton Stewart Initiative are launching their first Photography Competition, free to enter, and the prize is to be your photograph on the cover of our 2018 calendar and to be used on the month of your choice inside the calendar. All photos will be judged by the NSI Fundraising team and the overall winner and winners notified, the overall winner will be asked what Month of the 2018 calendar they would like their photo to be used on. 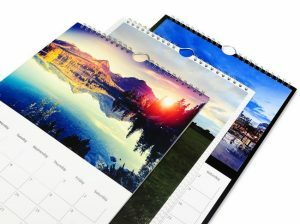 All other winningphotos will be allocated a given month in the calendar. 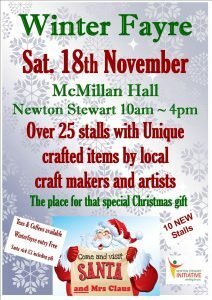 All photos must be of of Newton Stewart or Minnigaff, or from Newton Stewart or Minnigaff. This can include events, activities etc that take place in Newton/Minnigaff and is not limited solely to ‘Views Of’ type photographs. The photographs will be collated into a Calendar and printed at cost to the NSI and then sold in order to raise funds for our ongoing project work. Dig out your portfolios, check your memory sticks and have a look on your saved folders as this is a chance to publicise your work free of charge and have it distributed in over 250 calendars that are to be sold at our Winterfayre in November. No effort required just get your photos in to us as soon as you can.